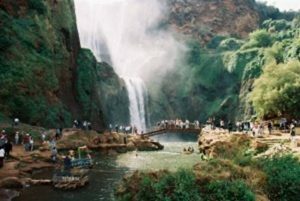 The Ouzoud Waterfalls Cascades are located about two and a half to three hours drive North east of Marrakech. The drive duration depends upon whether you are with a tour or driving yourself in a hire car. The fastest way to get to Ouzoud would be private tour, which would meet you at your Hotel and then start the journey directly. Shared group tours would need to pick each passenger up from their Hotels, so expect a delay of between 30 minutes to 1 hour before you actually start the journey to Ouzoud on a shared tour. If you are driving your hire car from Marrakech to Ouzoud, the joutney will most likely take about 3 hours. Not being very familiar with the roads, and perhaps being more cautious than a Moroccan driver would be, 3 hours should be sufficient time to allow for this journey.